Jane Twisden’ (Matthew Floyd Miller) and ‘Lady Enid’ (Jamie Torcellini). Photo by Chelsea Sutton. 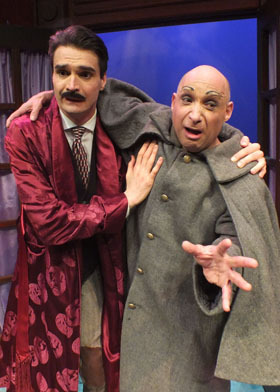 The Falcon Theatre is currently playing The Mystery of Irma Vep, written by Obie Award-winner Charles Ludlam, directed by Jenny Sullivan, and starring Matthew Floyd Miller and Jamie Torcellini. It is the second production of the Falcon Theatre’s 2013-2014 Subscription Season. The Mystery of Irma Vep is filled with vampires, werewolves, comic transvestites, highbrow literary jokes and lowbrow Egyptian graffiti. Written in 1984, Irma Vep is the late Charles Ludlam’s most successful horror sendup, a silly compilation of gothic fiction from Jane Eyre, slapstick comedy and fast costume changes. All eight roles, male and female, are played by the two lead actors in a rush of wigs, funny voices and drag acting. The plot has something to do with ancient Egyptian curses, werewolves and a jealous ghost. But it’s mostly an excuse to exercise Ludlam’s high-flown sensibility, complete with bad wigs, ominous organ music, buckets of dry ice, an anatomically correct wolf and other sights gags, all cavorting on a fun-house set design. Double entendres fly fast and furious, and every character seems to harbor a painful secret. The Mystery of Irma Vep is playing through November 17, Wednesdays through Saturdays at 8 pm, Sundays at 4 pm, $27 to $39.50, tickets available at www.falcontheatre.com.